Although, I am usually home all day most days Tuesdays is our homeschool community day. After being gone all day, I need quick dinners, which usually means crock pot meals or putting my Instant Pot to work. Since it has been cooler this week, I’ve been in the mood for soup. My favorite part about soup is that it’s typically a one pot meal, which means less mess to clean up afterward. Also, most soup recipes make quite a bit making lunch easier the next couple of days. 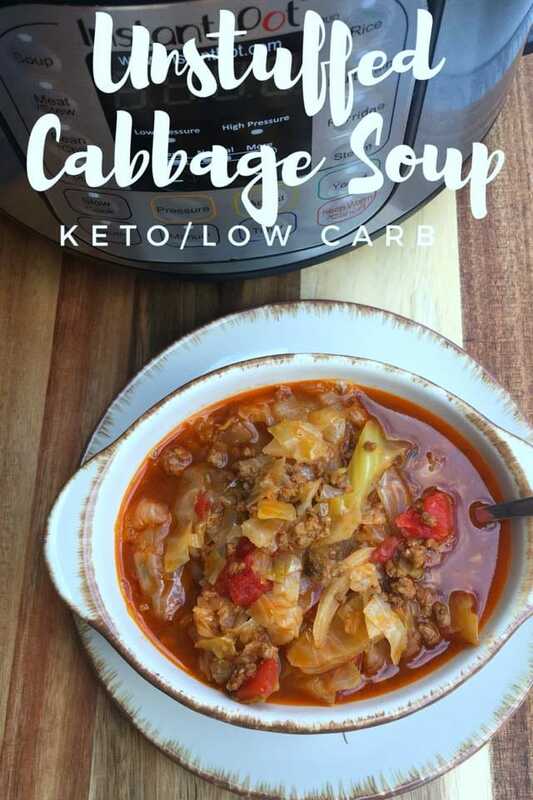 This Unstuffed Cabbage Soup is keto/low carb friendly and can be made either in the Instant Pot, Crock Pot, or on the stove. I’ve posted directions for each below for your convenience. 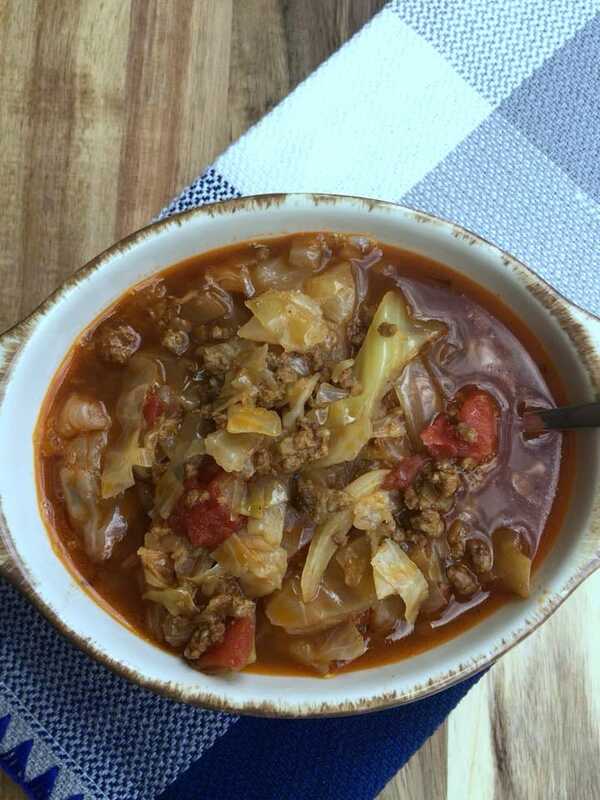 This Unstuffed Cabbage Soup turned out fabulous. Adding the Bragg’s Aminos gave it such rich flavor without adding a lot of carbs. You can always add riced cauliflower to the recipe as well if you miss the rice that is usually in cabbage rolls. I thought it turned out great as is. Turn Instant Pot on Saute and brown ground beef with diced onions and garlic then drain. Add beef mixture back to the Instant Pot then add all other ingredients. Place lid on Instant Pot and turn to lock position. Turn Instant Pot off Saute by pressing the off button, then press soup bottom and set the time for 15 minutes. Allow Instant Pot to come to pressure and complete the soup cycle. After the cycle is over, do a quick release of the steam valve. I always place a dish towel on the valve, so it doesn't spew hot steam on my hand. Brown ground beef with onions and garlic then drain. Add all ingredients to Crock-Pot and place lid on top. Cook for 3-4 hours on high or 6-7 hours on low or until cabbage reaches desired tenderness. In a stock pot brown ground beef with onions and garlic. Drain then return to pot. Add all other ingredients and cook covered on low/medium for 45 min to 1 hour or until cabbage is tender. Hi! This looks amazing. What if I do not have the Braggs Aminos? I could buy it… but is it necessary? Thanks! It makes the soup a lot more flavorful, but if you don’t have it the soup will still turn out it just won’t be quite as tasty. I made this today in the crock pot It was delicious. I used coconut aminos and fired roasted diced tomatoes cause that’s what I had. Will make it again!! Terrific recipe! I added a bit of water—about 3/4 cup—to make more broth, but this is a very satisfying soup on a cold winter day! Can soy sauce be used in place of the aminos? Sure! You are welcome to use whatever fits into your eating plan. Delicious!! Very flavorful. I didn’t have any Braggs Aminos so added 1 Tablespoon of soy sauce instead. This recipe is definitely a keeper. Yum! Thank you so much for sharing it. I have a Cuisinart electric pressure cooker so I don’t have a “soup” button on mine. Would I cook this at low pressure or high pressure? And how many minutes? Hmmmm….I’m not sure I have never used that brand so I don’t know. After I had everything in the crockpot I realized bread the recipe wrong and I used Braggs ACV and not Aminos. Also my tomato sauce had double the carbs sighhh. I usually pay close attention. I’m on maintenance mode so hopefully i don’t get kicked out of ketosis. Oops! I hope it still turned out okay but there is a big difference in ACV and Aminos. Just got my instant pot. This soup is my second attempt using IP. It is delicious. Thank you! It took 30 minutes to come to pressure. At around 20 minutes a little steam came out of vent, (not around rim). Is this normal for it to take this long long and for steam to escape? It can take a while for it to come to pressure. Awesome! So glad you both enjoyed it. A “third bowl” definitely means it is a winner. Wow, this soup is AWESOME! I didn’t have the Bragg’s, so used 1 Tablespoon of Soy Sauce instead. VERY good recipe, and I will certainly make it often. All the wonderful taste of Cabbage Rolls without the work! (I made it in my Instant Pot). 🙂 Thanks! Awesome! I am so glad you loved it! Can you use bone broth? I haven’t tried it with bone broth so I can’t say from personal experience, but give it a try and let me know how it turns out. I’ve made this exclusively with beef bone broth i’ve also made in my instapot (before hand. Then used in rhe soup). Its truly amazing. Fantastic use of the bone broth. Great recipe! Thank you so much for sharing it! Actually coming from a Polish Jewish family when bubbe made her stuffed cabbage rolls she put lemon and vinegar in the tomato sauce w a little brown sugar . You want a tart slightly sweet sauce to be authentic. I noticed most of these recipes make it an Italian marinara which traditionally it is not. So that ACV is perfect. I am 100% Polish. I don’t put any sugar, lemon or vinegar my stuffed cabbage no one in my family does. It must be your bubbe’s twist on the traditional Golumpki. And yes never use marinara. A quick release stops the cooking process. Perfect! Glad you loved it. Thank you! I have a bag of frozen cauliflower rice do I need to unthaw it and get water out of it ? It depends on what kind of frozen cauliflower rice you have. I buy the steam bags personally and cook them first before adding to recipes. 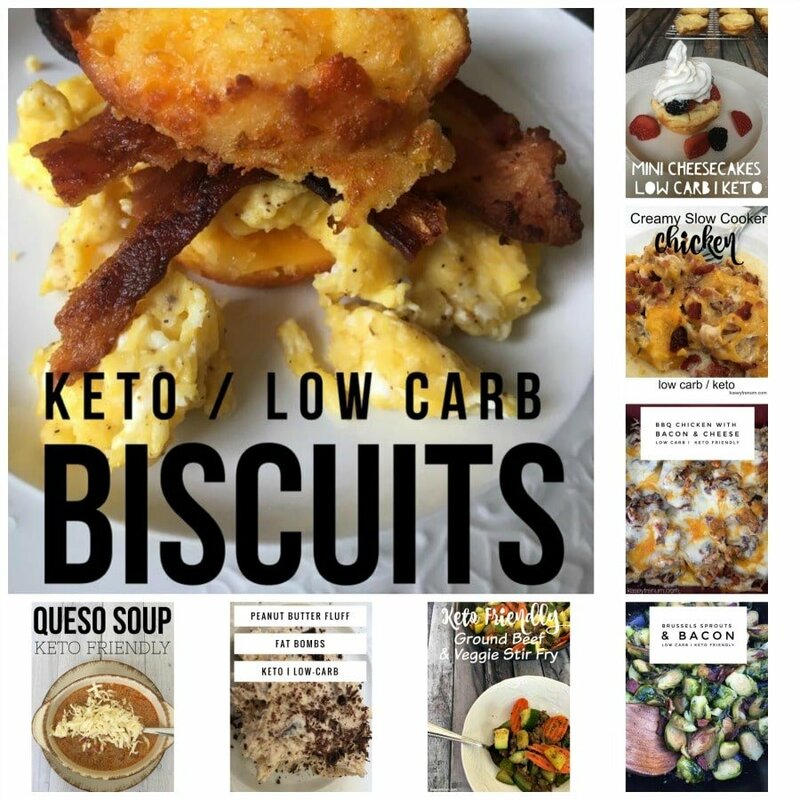 Just starting keto diet, l look forward to trying your recipes. They are explained so well by you. Love searching thru your many recipe options. Wish me luck, here I go!! Hope things are going well!! Love, love, love this soup. I make a huge pot and freeze it in individual portions to take to work for lunch. I also add a dstspn of Greek yoghurt to serve, delish! I made this today and i absolutely loved it!!! Thanks Kasey!!! This sounds like something I need to try. I really like The recipe for this soup is truly unique. So how many ounces would a small/medium head of cabbage be? I don’t know. I just look at the ones that are available at the grocery store and choose a small to medium one. Got this in my crockpot and can’t wait to have it tonight! How good is this freezing? I was thinking o feezeing half it so I can use another time. I’m sure it would be fine, but I haven’t tried freezing it. So glad you have loved all of the recipes you’ve tried. Thank you! Very good! I used Jimmy Dean hot sausage to give it a little kick. Will definitely be making this again. Thanks for the recipe! Awesome! Glad you liked it. My hubs would love the spicy sausage too!! 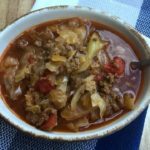 ***** This is the best Unstuffed Cabbage Soup I have ever made. The liquid aminos adds so much flavor. I don’t like tomatoes. Is it ok to add other vegtables. Will it still be ok without. I’m not sure I have only made this recipe as is. I’m reading reviews again. I’m sure recipe says 1/4 cup of Bragg Amino. But I see people saying they used a Tablespoon. Huh? I’m stuck on the 3 t worschester sauce, which 3 t is actually same as 1 T. I’ve always used Bragg Amino in place of worschester and/or soy sauce. Just small minor details? I’m sure the Bragg will be plenty and I’m tempted to pour in the rest of the beef broth. What to do with the one cup left from a quart??? A stickler for details. LOL. Love your recipes. especially the nut crusts for the strawberry pie which I added some whole blackberries and red raspberries into, beautiful when slicing. I detest almond and coconut flour texture! SO huge thanks!! Glad you enjoy! Thanks, PJ.